Using next generation DNA sequencing, Dartmouth scientists have identified potentially actionable mutations in cancers of the appendix. Their study, "Molecular Profiling of Appendiceal Epithelial Tumors Using Massively Parallel Sequencing to Identify Somatic Mutations," was published in the journal Clinical Chemistry today. When specific mutations for a cancer type are identified, patients can be treated with chemotherapy or other targeted agents that work on those mutations. Little is known about the molecular biology of two types of appendix tumors, low-grade appendiceal mucinous neoplasm (LAMN) and adenocarcinoma, but both can lead to pseudomyxoma peritonea (PMP), a critical condition in which cancerous cells grow uncontrollably along the wall of the abdomen and can crush digestive organs. Dartmouth pathologists studied 38 specimens of LAMN and adenocarcinoma tumors (some of which had progressed to PMP) from their archives to look for shared genetic errors that might be responsible for the abnormal cell growth. Tissue samples were sequenced using the AmpiSeq Hotspot Cancer Panel v2, which pathologists had verified for the clinical screening of mutations in 50 common cancer-related genes for which treatments exist. This was the first study making use of a multigene panel in appendiceal cancers to support the use of potential targeted therapies. "We routinely use this molecular profiling approach on all of our lung adenocarcinomas, melanomas, colon cancers, and gliomas," said Gregory Tsongalis, PhD, principal investigator for the study and director of Molecular Pathology at Dartmouth-Hitchcock Norris Cotton Cancer Center. He says examining an individual tumor profile has the potential to significantly alter patient outcome in a positive way. KRAS and GNAS mutations were the most common alterations identified in the study. Twelve distinct abnormalities were mapped to the KRAS gene. Additional mutations were identified (i.e., AKT1, APC, JAK3, MET, PIK3CA, RB1, and STK11 for LAMN and TP53, GNAS, and RB1 for adenocarcinoma) in the four sample types studied. Seven of these mutations were shared by more than one group, which suggests there is some molecular similarity. "These findings suggest that tumors of the appendix, although rare and very aggressive, are distinct entities and have subclasses of disease within each category that are different from each other based on their mutation profile," said Tsongalis. "New therapeutic approaches may be able to target those pathways that are mutated in these tumor types." This laboratory research has the potential to change clinical practice if physicians now develop treatment plans to target the identified genetic mutations. 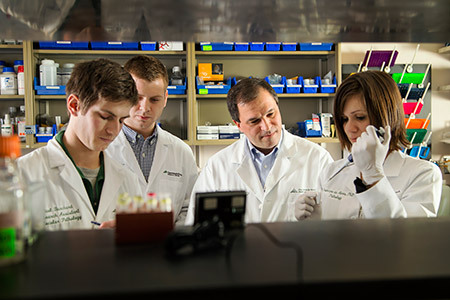 "Our success in the Dartmouth-Hitchcock Medical Center Department of Pathology at the Norris Cotton Cancer Center is attributed to our multidisciplinary approach to these discoveries, which truly allow us to bring scientific findings from the bench to the bedside," said Tsongalis.